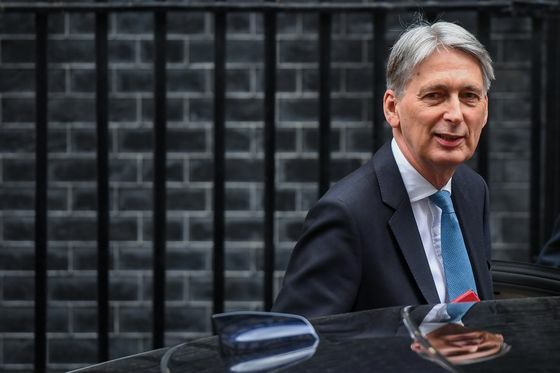 (Bloomberg) -- Chancellor of the Exchequer Philip Hammond and other cabinet colleagues publicly backed Theresa May on Sunday as several British newspapers said the prime minister is under increasing pressure to stand down over her handling of Brexit. May met with government ministers and other senior Conservatives to discuss Brexit at her Chequers retreat on Sunday, a spokesman for the prime minister said. The “lengthy talks” covered a range of issues, “including whether there is sufficient support in the Commons to bring back” her deal this week, according to the spokesman. The meeting came after Sunday Times, Sunday Telegraph, Mail on Sunday and the Observer said cabinet ministers were taking steps to remove May and install an interim leader to complete the Brexit process. According to the Sunday Times, at least six senior ministers want her deputy, David Lidington, to take the job until there’s a formal leadership election. They’ll confront her at a cabinet meeting Monday, and threaten a mass resignation if she doesn’t step down, the report said. Michael Gove, a leading Brexiteer in the 2016 referendum, and Foreign Minister Jeremy Hunt also have some support. Lidington said Sunday that he had no interest in taking May’s job, adding that “one thing that working closely with the prime minister does is cure you completely of any lingering shred of ambition to want to do that task.” He was interviewed outside his home. Gove, also speaking outside his home on Sunday, said he backed May and rejected any plan to change the prime minister. May has two weeks to find a way forward after the European Union postponed the U.K.’s March 29 exit date, and hopes to hold a third vote on her Brexit deal in the coming week and give members of Parliament a chance to weigh in on alternatives. The prime minister has grown increasingly isolated in recent months, both at home and in Brussels, and colleagues were irked by last week’s televised address that blamed the deadlock on the House of Commons. 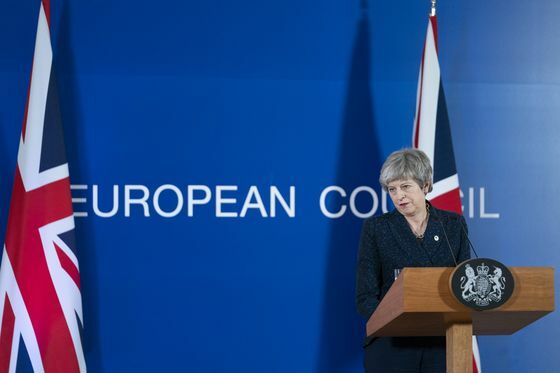 When presented with a list of possible options, he ruled out a no-deal exit or revoking Article 50 -- which is the formal notification to the EU -- but he was less equivocal about the prospect of a second vote. Another referendum "deserves to be considered” along with other proposals, he said, but added that he didn’t think there was majority in Parliament for such an outcome. Hammond’s comments could enrage anti-EU members of May’s party, who -- along with the prime minister herself -- have argued against another vote. Meanwhile, Brexit Secretary Steve Barclay, who told the BBC’s “Andrew Marr Show” that it wasn’t the right time for a leadership contest, said that any majority in indicative votes planned in the coming week will not be binding. If Parliament voted for a softer Brexit, it would collide with the Conservative’s 2017 manifesto and risk a general election, he said. With Parliament due to enter another crunch week of votes, an estimated 1 million anti-Brexit protesters rallied alongside leading politicians in central London on Saturday to demand a second referendum. Meanwhile, an online petition urging the government to cancel Brexit neared 5 million signatures -- the most names ever collected in a public campaign. On Sunday, Labour’s Hilary Benn, chairman of a Parliament committee on Brexit, and Green Party politician Caroline Lucas -- both long standing critics of May’s agreement -- said they’d support a plan to hold a confirmatory public vote on the prime minister’s twice-defeated deal. Lucas said she’d back May’s Brexit deal “with a heavy heart” if it was “intrinsically linked” to another vote -- a similar pledge to that made by deputy Labour leader Tom Watson on Saturday.